The 10K Inline Muffin Monster® is the perfect fit for many smaller wastewater sludge processing systems. 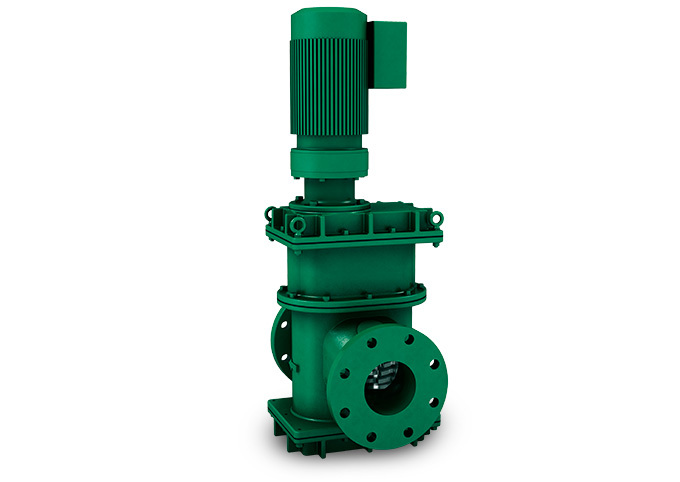 Packed with power, this sludge grinder converts the 2-3 hp (1.5-2.2 kW) motor into a cutting force ready to keep sewage and sludge flowing through progressive cavity pumps, valves, centrifuges and heat exchangers. Two stacks of hardened steel cutters rotate slowly and with incredibly high-torque to break down solids including rags, rocks, sticks and plastics. It will stand up to the tough conditions where other technologies like macerators or a sewage comminutor will fail. The 10K Inline Muffin Monster sludge grinder easily bolts into pipelines with standard ANSI flange connections. It can also be mounted in any orientation giving designers full flexibility to squeeze in Monster protection. Due to its small size this little Monster is also an ideal option for protecting sewage pumps in office buildings, apartment complexes, resorts and retail centers where space is limited. The 10K Inline Muffin Monster is also available with JWC’s Wipes Ready Technologies. This includes special 17 tooth serrated cutters that will slice wipes in two directions and keep them from reweaving with hair and grease. If you need your Muffin Monster fast, the 10K Inline Muffin Monsters are NOW available with the Monster Quick Ship. Click here to learn more about Monster Quick Ship.